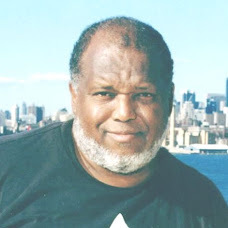 I WALKED IN THE DOOR AFTER DROPPING OFF THE GRANDKIDS FROM SCHOOL, TO HEAR THIS RECORDED PHONE MESSAGE FROM DONNIE BLACK IN BROOKLYN--->>> " BAD NEWS," WILLIE WILLIAMS, OF JHS 35 AND FRANKLIN K. LANE FAME, PASSED AWAY AND THE FUNERAL SERVICE IS SET FOR THURSDAY, FEBRUARY 12, 2004. WILLIE AND I PLAYED TOGETHER ON THE JHS 35 TEAM BEFORE HE JOINED GLENN AND GERRY DAVIS AT LANE - WILLIE'S SENIOR YEAR AT LANE WAS 1963. I FEEL LIKE I SHOULD SAY SOMETHING ABOUT MY FORMER TEAMMATE, BUT I CAN'T SAY ANYTHING GRAND - I LOST CONTACT WITH WILLIE AND OUR PATHS CROSSED VERY FEW TIMES AFTER HIGH SCHOOL. WILLIE HAD A BIG HEART, SEALED IN A SMALL BODY, A LION'S HEART, THAT BECAME APPARENT WHILE HE WAS PLAYING HIS FAVORITE SPORT. IN A WAY, IT IS FOOLISH TO LOOK AT A PERSON'S LIFE AND MAKE THE COMMENT THAT HE WAS A FINE BASKETBALL PLAYER --- THAT IS SUCH A SMALL THING IN THE BIG EQUATION OF LIFE. EACH OF US PLAYS A MINIMUM OF 25 ROLES IN LIFE --- SON, BROTHER, COUSIN, HUSBAND, FATHER, GRANDFATHER, EMPLOYEE, EMPLOYER, FRIEND, COLLEAGUE,TEAMMATE, ETC. TO FOCUS ON A LIFE OF ALMOST 60 YEARS AND SAY, HE WAS A SUCCESSFUL BASKETBALL PLAYER, AMID ALL THESE ROLES, IS, AT FIRST, KIND OF FOOLISH, STRANGE AND SAD; YET, IT MAKES PERFECT SENSE, IF YOU THINK ABOUT IT. I DON'T KNOW WHAT KIND OF HUSBAND, DAD OR EMPLOYEE WILLIE WAS -- I CAN'T SAFELY GO THERE -- I DON'T KNOW WHO WILLIE LOVED OR HATED, WHAT GOD, IF ANY, HE WORSHIPPED, WHAT ACTIONS HE REGRETTED, WHAT JOYS HE REVERED -- THESE ARE PRIVATE AND PERSONAL MATTERS. ON THE BASKETBALL COURT, WILLIE WAS A PUBLIC FIGURE AND I KNOW ABOUT THIS PUBLIC ASPECT OF HIS LIFE -- SO, IN SAYING HE WAS AN EXCELLENT BASKETBALL PLAYER, I AM NOT REDUCING HIS LIFE TO HIS ABILITY TO PLAY A GAME; I AM SAYING THAT IN THE PUBLIC ARENA OF SPORTS, HE SHOWED THOSE QUALITIES AND CHARACTERISTICS OF COURAGE AND DETERMINATION AND LEADERSHIP, THAT I WOULD HOPE CARRIED OVER TO THE REST OF HIS LIFE. THE FACT THAT HIS LIFE WAS NOT, ON THE SURFACE, ALWAYS PLEASANT ONE, DOES NOT MEAN THAT THOSE QUALITIES I SAW ON THE ATHLETIC FIELD, WERE NOT A TRUE REFLECTION OF WILLIE AS A TOTAL PERSON --- NONE OF US KNOWS AND FULLY APPRECIATES THE DEMONS CARRIED BY THE REST OF US. NOT KNOWING WILLIE'S DEMONS, I CAN'T SAY HOW WELL HE FACED HIS NIGHTMARES AND IT IS NOT MY PLACE TO JUDGE WILLIE -- AT DECATUR JUNIOR HIGH.SCHOOL, I WAS BOTH JEALOUS AND ADMIRING OF HIS TALENT AND HIS FIERCE HEART - THAT IS HOW I ALWAYS SEE WILLIE IN MY MIND, A LION READY TO BATTLE FOR SUPREMACY OF HIS DOMAIN. WILLIE COULD BE BEATEN - THE PROBLEM FOR OPPONENTS WAS ACHIEVING THAT BEATING, KNOWING THAT WILLIE WAS NOT GOING TO SURRENDER, VICTORY WAS NOT GOING TO BE EASILY WON AGAINST WILLIE WILLIAMS. 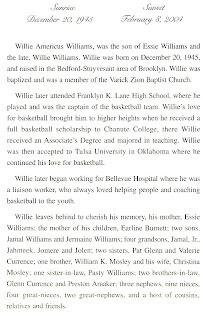 I BELIEVE THAT THOSE QUALITIES WHICH MADE WILLIE SPECIAL AND ADMIRABLE, MAY HAVE, FOR A TIME, BEEN OVERWHELMED BY EVENTS IN HIS MIND AND LIFE, BUT MORE THAN LIKELY, HE PUT UP A BETTER FIGHT THAN I COULD HAVE, GIVEN THE SAME CIRCUMSTANCES / SITUATION. I SPEND FAR TOO MUCH TIME WRITING ABOUT THE PASSING OF THOSE WHO RAN THE STREETS OF MY YOUTH -- AND YET, DEATH IS NATURE'S WAY AND WE HAVE TO MOVE ON -- NOT FORGETTING OUR PALS, BUT ACCEPTING THEIR GOING ON AHEAD OF US -- AND UNLESS SOMETHING VERY RARE HAPPENS ( AND THERE HAS BEEN ONLY ONE EXCEPTION IN THE LAST 2005 YEARS ), WE WILL CATCH UP WITH ALL OF THE DEARLY DEPARTED, DOWN THE ROAD. I WILL ALWAYS SEE WILLIE AS A BIG MAN, IN A SMALL BODY -- I WILL PRAY THAT GOD BLESS HIM AND HIS BROTHER, RICHIE.